The inspiration for Asana came when Dustin Moskovitz and Justin Rosenstein created an internal tool at Facebook that revolutionized the way work coordination was handled in this company and contributed to its major success. They wanted to share this amazing technology with the world and created Asana, one of the most popular and renowned collaboration tools in existence. In this Asana review, we will highlight all the major features of this tool and help you understand how it can be of use to your team. Asana is a web-based tool designed to facilitate collaboration and workflow management. It offers a range of options for efficient task management, including assigning tasks, setting due dates, adding subtasks, introducing tags for easier search, and having a clear view of both completed tasks and those that are in progress. Collaboration and communication are facilitated with comments detailing what needs to be done, attachments, status updates, announcements, and other information that can be of use to everyone involved. 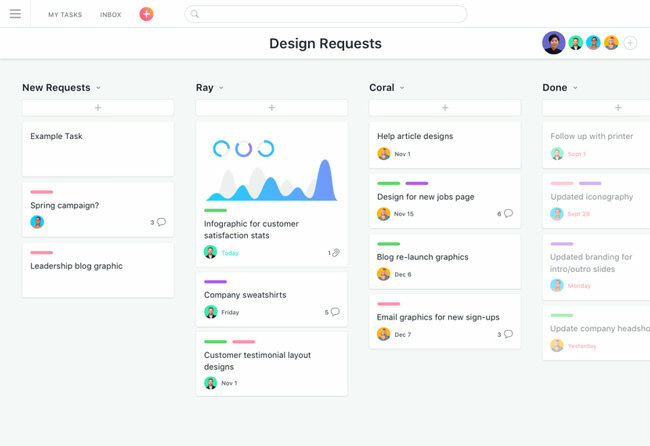 With Asana, all team members have equal access to all features, so they can view their pending tasks, edit project details, and use communication tools to share important data with other members. This tool can be used to manage both ongoing tasks and projects, which is one of the qualities that make it different from project management tools. While it is web-based and its creators do not plan on creating desktop apps any time now, you can manage your tasks on the go with its handy mobile apps. Is Asana Right For Me? 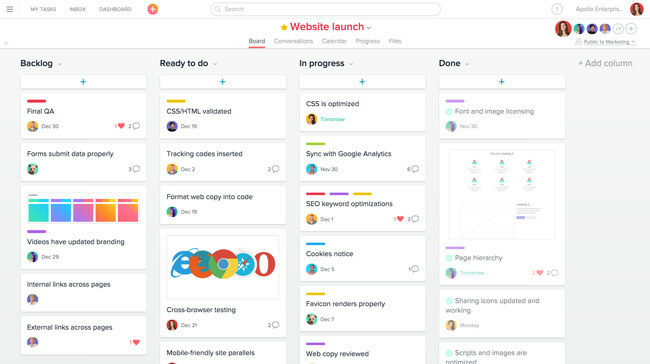 Whether your team has fewer than 15 members or you are managing a large enterprise, Asana is a tool that can help you stay on top of everything, make sure deadlines are met, and reach your goals more easily. The technology behind it has helped giants like Facebook, but it can be of great use to small businesses as well, allowing them to benefit from enhanced collaboration and a more efficient way of assigning and managing tasks. According to the official Asana website, getting started with this tool is just as easy as creating a list or sending an email. The truth is that the use of this tool is not predefined, leaving plenty of room for customization. This may make it harder for many to figure out how they want to organize their work using Asana and it may take some time until you get it right. However, with handy video tutorials to help you understand what Asana can do for you, you can become an advanced user rather quickly and enjoy exploring the full potential of this mighty tool. 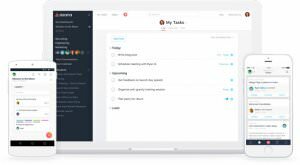 Previously in this Asana review, we mentioned some of its key tasks and workflow management features, including assigning task and subtasks, setting due and recurring dates, and viewing progress and completion information about all of your tasks and projects in one place. One of the greatest advantages of Asana is that you can mark tasks as dependent on others, with automatic notifications sent to assignees when it is time for them to get started with their part of the work. Instead of just listing tasks, Asana allows you to provide all the key information about each task, along with related documents and links, making it easy for team members to understand what they are supposed to do. Keeping track of everything is made easier by the follow/unfollow option, which allows you to receive updates only on the tasks that are relevant to you. This allows you to prioritize and be aware of every change as soon as it happens, so you can act accordingly and in a timely manner. If you are handling a large number of tasks or projects at the same time, you can rely on advanced search to help you find the work you are looking for. That is where tags come into play, allowing you to benefit from smart classification. We particularly like the fact that Asana allows you to add custom fields that can help you track what is important to you, whether it is task priority, status or anything else that may be of relevance, enabling you to manage tasks in a way that works best for you. Asana offers a variety of features designed for smoother collaboration and interaction between team members. Apart from allowing for easy creation of tasks and subtasks with clearly marked assignees and simple organization of tasks into lists, this tool allows you to keep all of your tasks and projects in a single, readily customizable environment, viewable and editable for all members of the team. By adding comments to tasks, you can give instructions and feedback and ask questions. You can follow tasks and projects that you are currently working on and have automatic updates about all the work relevant to you sent straight to your inbox. You can invite guests to join projects and facilitate collaboration with your partners, vendors, and contractors. With team pages, you can interact with your team and have a clear view of all of your team’s projects. Asana integrates with more than 100 of the most popular tools and applications that can make managing tasks and workflow even easier. You can integrate Asana with dozens of tools used for communication, development, reporting, time tracking, file sharing, and more, as well as with Google apps. Some of these integrations include Slack, Microsoft Teams, Zapier, Unito, Github, Instabug, Dropbox, Google Drive, Google Sheets, Google Forms, Everhour, DigiSpoke, Harvest, Hubstaff, JotForm, and Wufoo. Asana offers a free plan designed for teams of up to 15 members. Features included in the free plan include unlimited tasks, projects, and conversations, basic dashboards, and basic search. For small and medium-sized businesses, Asana has created the Premium plan that costs $9.99 per team member per month. Small teams of up to 15 members get a discount, so they pay $7.50 per member per month with the monthly subscription and $6.25 per member per month with the annual subscription. With this plan, there are no limits on the number of team members and you get to enjoy a variety of benefits, including unlimited dashboards, advanced search and reporting, custom fields, task dependencies, start dates, admin controls, customer success webinars, priority support, and Google SSO. For large enterprises, Asana creates custom Enterprise plans in accordance with its clients’ needs. The advantages of Enterprise plans include access to advanced admin controls, specialized help from the Asana customer success team, same-day support, increased control and security with user provisioning and deprovisioning, data deletion, and cross-regional backups, as well as custom branding. According to the words of the users of this tool, Asana is easy to use but may be hard to get used to. While this may seem contradictory, it is in fact in line with what we previously said about its unique format and extreme customizability. Users generally describe it as a reliable, productivity-boosting tool that provides excellent user experience. Negative reviews are highly uncommon, with very little complaints and mostly benevolent suggestions for improvement, including more filtering options, more flexible templates, calendar organization options, and a better-organized inbox. Users’ relationship with Asana cannot always be described as love at first sight but it is rarely anything short of a long-term relationship built on unshaken trust. While it may take some time to get accustomed to it, this collaboration tool boasts unparalleled flexibility and allows you to employ team and task management strategies that perfectly suit the needs of your team without being forced to conform to a predefined format. Its set of features is impressive, it integrates with more than 100 apps for easier management, and it even offers a free version that allows you to get a taste of what it has to offer. If you are looking for a powerful collaboration tool that you can mold to your needs and desires, Asana is the way to go. Our ratings are the result of an objective and independent evaluation of Asana, generating the final rating that reflects the overall quality of the company. Ratings may change as the service changes. 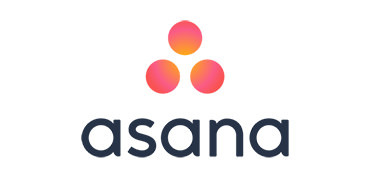 Asana user rating based on 3 user reviews. I’m using the free version, so I can’t speak about all the fancy features, but I love the clarity it provides, it really makes it easier to organize tasks and prioritize, so I’m pretty happy with it so far. Apart from the overwhelming notifications and cluttered inbox, there is nothing I don’t like about Asana. It is easier to use that other collaboration tools I tried and it definitely offers more options and better organization. Still figuring out all the features, but everyone on the team loves it already, the best collaboration software we have used in our 5 years of working together. 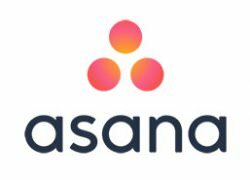 There’s no Asana coupons or discounts right now.